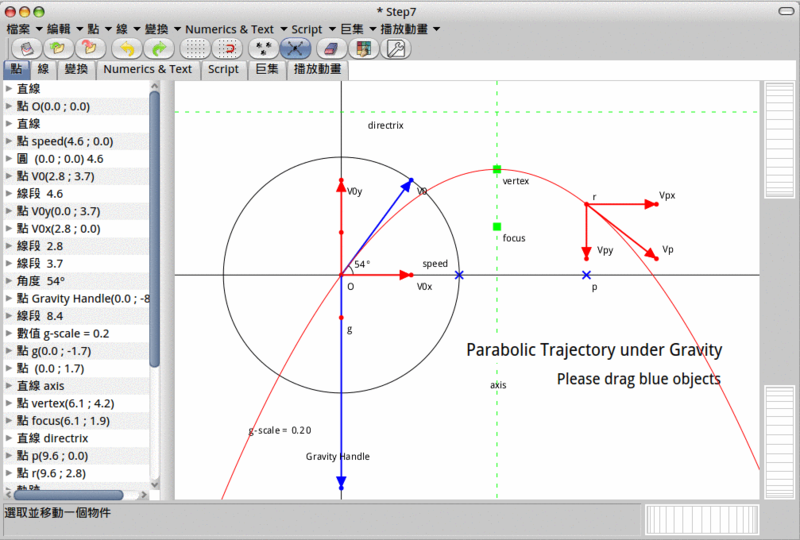 Drawing the Parabolic Trajectory of an Object under Gravity - Dr. Geo, be a geometer! Enable "axes" and "magnetic grid" in "edit" menu. Create points "Ha" and "Hb" far out along the x-axis, say (-40,0) and (40,0). Create the straight line passing "Ha" and "Hb" as the horizon. Hide and lock "Ha" and "Hb". 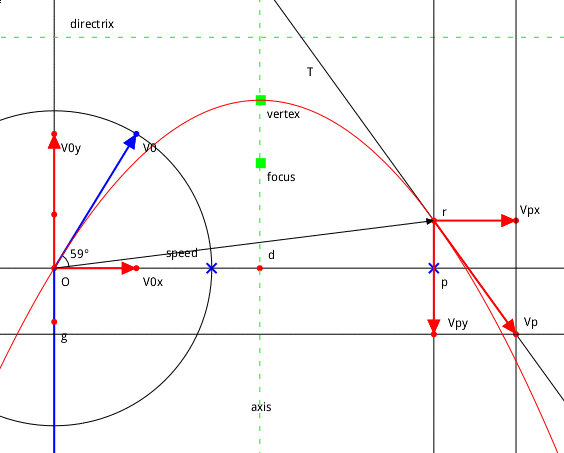 Create a circle centered at the origin "O" and passing a point "Speed" along the x-axis. Lock "O". Create a straight line passing "O" perpendicular to line "Ha"-"Hb". This is just the y-axis. Disable axes and "magnetic grid" in "edit" menu. Create a line segment from "O" to a free point "V0" on the circle. 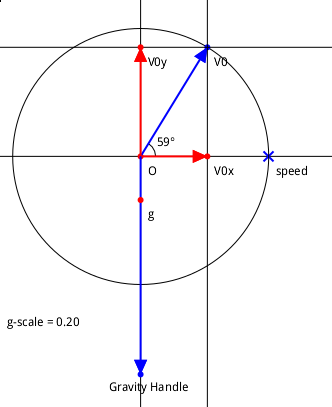 This is the initial velocity vector. From "V0" draw lines perpendicular or horizontal to the axes and intersect the x-axis/y-axis at "V0x"/"V0y". Hide the two auxiliary lines. Draw line segments "O"-"V0x" and "O"-"V0y". These are the initial velocities along the two axes. We also need the gravity vector. But later you would find that it's difficult to drag the gravity vector directly because it's too close to the origin (if we want to see the interesting portion of the parabola). 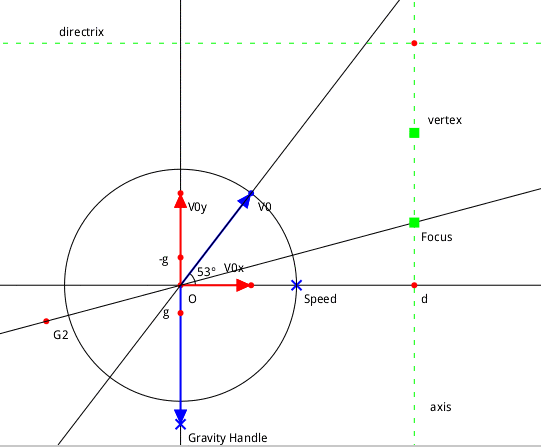 So we create a point "Gravity Handle" along the negative y-axis at a comfortable distance, and create the point "g" as the end point of the real gravity vector at roughly 0.2 or 0.25 times distance. To do this you need to create a number "g-scale", set it to 0.2 or 0.25, and use the Homothety transform (i.e. homogeneous dilation) to scale "Gravity Handle" down towards "O". To draw the parabola, we need to find its focus and directrix. Obviously the axis of the parabola is the vertical line at d=V0x*tx distance away from the y-axis where tx is the time for the vertical component of the velocity to reach zero. Therefore d/V0x = V0y/(-g). At time tx the object also reaches the hightest point of its trajectory at the height of hx=-g*tx^2/2=(d*V0y)/(V0x*2). Therefore 2*hx/V0y = d/V0x. Use mirror or symmetry to find the point "-g" on the positive y-axis. Draw straight line "-g"-"V0x". Draw a straight line parallel to "-g"-"V0x" and passing "V0y". Intersect the latter line with the x-axis at point "d". Draw x-axis's perpendicular line at d. This is the "axis" of symmetry of the parabola. Draw straight line "V0x"-"V0y". Draw a straight line parallel to "V0x"-"V0y" and passing "d". Intersect the latter line with the y-axis at point "2h". Find the midpoint of "2h" and "O" as "h". Draw x-axis's parallel line passing "h" and intersect it with "axis" at point "vertex". 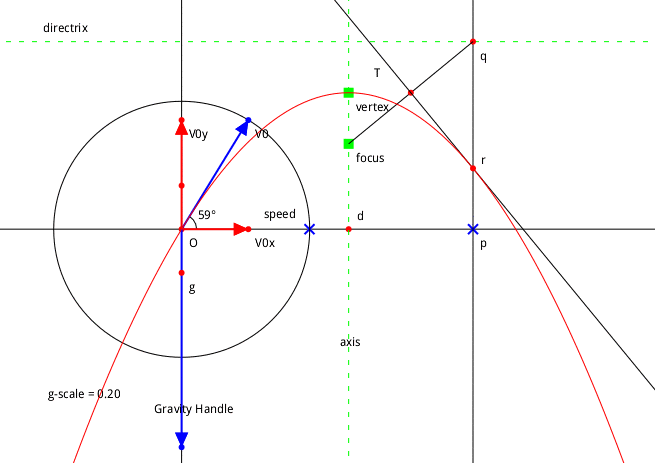 This is the top of the trajectory, also called the vertex of the parabola. Hide the two pairs of auxiliary parallel lines. Hide "2h" and "h". Next we find the focus of the parabola. It lies somewhere on the axis of symmetry. Recall that any light coming from the focus will be reflected -- if the parabola represents amirror -- into the direction parallel to the axis of symmetry, and vice versa. Also recall that the instantaneous velocity is tangent to the parabola. Draw the straight line "O"-"V0" and use it to mirror the "Gravity handle" (or "g" or "V0y", either will work) into the point "G2". 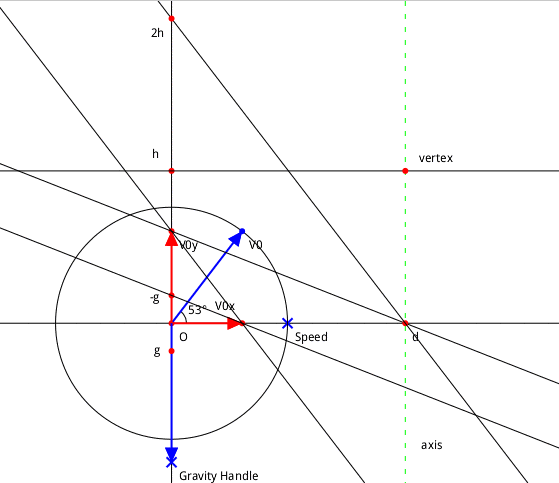 Draw straightline "G2"-"O" and intersect it with "axis" to obtain "Focus". Apply Homothety or Reflection to Focus and draw a line parallel to the x-axis. This is the directrix of the parabola. Hide the auxiliary lines and points. Now we can draw the parabola. Recall that it is the locus of all points that are equally distant from the focus as from the directrix. Draw a free point "p" on the x-axis. This point will provide user interaction to control the position of the instantaneous velocity drawing. Draw the line vertical to the x-axis and passing "p", then intersect the line with the directrix at point "q". Draw line segment "Focus"-"q". Find its midpoint "m" and draw the straight line "T" perpendicular to the line segment. Intersect "T" with "p"-"q" at "r". Use the locus tool in line menu to draw the parabola, using "p" as the free (independent) point and "r" as the relative (dependent) point. Hide the auxiliary lines and points except line "T". Finally we will draw the instantaneous velocity at point "r". Draw vector "O"-"r". Use it to translate the point "V0x" to "Vpx". Draw line segment "r"-"Vpx". This horizontal component of the instantaneous velocity remains constant at all times. The instantaneous velocity lies on the tangent line "T". So from "Vpx" draw a vertical line to intersect with "T" at "Vp". This is the end point of the instantaneous velocity. From "Vp" draw a horizontal line to intersect with straight line "p"-"r" at "Vpy". This is the end point of the vertical component of the instantaneous velocity. Clean up the drawing and add some textual explanations. My first attempt created a sketch that became broken when the initial velocity moves out of the first quadrant (x>=0, y>=0). I guess it was because at some step an absolute value (length) was taken. It's probably better to think in terms of and make use of parallel lines instead of sign-less lengths when you construct a sketch. In fact Dr. Geo has very powerful smalltalk scripting capabilities. However, drawing this sketch using only the basic drawing primitives makes it so... classic and so much more fun. I also learned one or two properties about parabola that I never knew as a high school kid (or as an adult).